The construction of Atlantic Mercy is scheduled to be completed by July 2017. Image courtesy of Mercy Ships. Mercy Ships also operates Africa Mercy, which is currently the world’s biggest hospital ship. Image courtesy of Mercy Ships. Island Mercy served Mercy Ships from 1983 to 2001. Image courtesy of Mercy Ships. Atlantic Mercy, Mercy Ships’ latest addition to its fleet of travelling hospitals, will provide free health care, community health education and palliative care for terminally ill patients. Swedish company Stena RoRo was awarded a contract to build the non-governmental hospital vessel in March 2014. The ship will be built by China Shipbuilding Industry Corporation (CSIC) at the Tianjin Xingang Shipyard. French ship brokerage company Barry Rogliano Salles (BRS) was appointed as the shipbroker. At an estimated cost of more than $100m, it will be the world’s biggest civilian hospital ship upon completion. Its sister vessel, Africa Mercy, was deployed in 2007, after which the other Mercy ships, Anastasis, Caribbean Mercy and Island Mercy, were retired from service. ABB was contracted in March 2015 to supply electrical propulsion and power systems for the vessel. Britannia is a cruise liner constructed by Fincantieri for the British cruise line Peninsular and Oriental (P&O) Cruises. Atlantic Mercy will be 174.1m long, and have a moulded breadth of 28.6m, operating draft of 8.6m and gross tonnage of 37,000t. The 4,500dwt hospital ship will have a total deck area of approximately 30,000m². Finnish company Deltamarin designed the vessel under a €4.2m (approximately $5.81m) contract. The vessel will be certified as a passenger ship fit for long international voyages. It will be registered under the Maltese flag with Lloyd’s Register classification. Atlantic Mercy will provide medical help to the poor and needy across the globe by making long stops in each port for approximately nine to ten months. 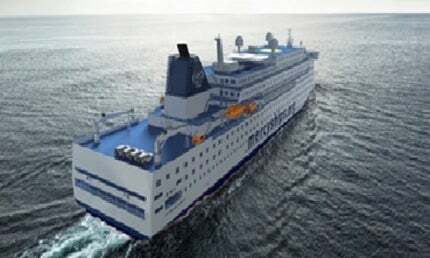 It will provide accommodation to 500 people including crew and medical staff onboard while travelling. The capacity will increase to 950 when the vessel is anchored in port. There will also be a school and kindergarten for children of the staff aboard the ship. Atlantic Mercy will contain two hospital decks. The hospital will cover approximately 7,000m², spanning most of decks three and four. It will be outfitted with six operating rooms, an intensive care unit, clinical laboratory, diagnostic radiology, hospital supply and pharmacy services. "Advanced machinery systems will be installed onboard the vessel to provide pre-operative and post-operative care." The onboard hospital will be named the Sue and Bill Gross Healing Hospital, honouring the donation of $20m made by the Laguna Beach philanthropists Sue and Bill Gross. There will be a total of 641 beds, including 109 acute care and 45 self-care beds in the 277 cabins. Other facilities in the hospital will include a dedicated conference space and a medical simulation lab for training. Advanced machinery systems will be installed onboard the vessel to provide pre-operative and post-operative care. Atlantic Mercy will be designed to perform a wide range of life-changing surgeries, such as maxillofacial, cataract removal, lens implants, tumour removal, cleft lip and palate reconstruction, orthopaedics and obstetric fistula repair. The ventilation system will be modelled to ease the stay of the patients onboard. The hull will be optimised for easy manoeuvrability. Bunkering of the vessel will be completed in an interval of four to six months. The vessel will be fitted with cranes for lifting provisions, and cars to be used for land transport. Provisions such as food supplies and medicines will be supplied on the ship using two 40ft containers. Atlantic Mercy will run on a diesel-electric propulsion system. It will be equipped with four medium-speed diesel engines, waste heat boilers and silencers. ABB will supply a pair of its Azipod® C gearless steerable propulsion systems and the main electrical power plant for the vessel. The ship will meet high standards of performance to reduce vibration and noise levels. The propulsion system will allow the vessel to cruise at a maximum speed of 12k.